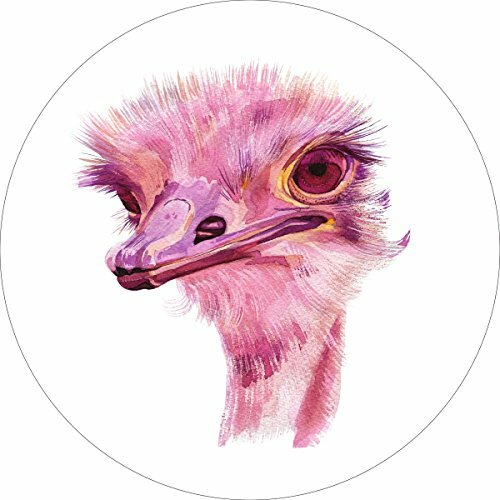 Ostrich Home Wall Shelf Decor Animal Decorations Watercolor Round Sign - 18 Inch, Plastic by iCandy Products Inc at Animal Backgrounds. MPN: 80-Round18In-Plastic. Hurry! Limited time offer. Offer valid only while supplies last. iCandy Products specializes in bringing beautiful wall decor signs at a price more affordable than most retail prices without sacrificing quality. iCandy Products specializes in bringing beautiful wall decor signs at a price more affordable than most retail prices without sacrificing quality. Each sign is printed in UV ink with our sign making process. Included is double sided outdoor / indoor hanging tape for easy installation. The animals we have designed for our watercolor series features animals from the forest, ocean, sea, wilderness, mountains, and jungle. Our watercolor art also looks good on a shelf in a baby nursery, home office, bathroom, or anywhere you need decorations in your home. If you have any questions about this product by iCandy Products Inc, contact us by completing and submitting the form below. If you are looking for a specif part number, please include it with your message.